Most of the Sections are structured in 3 tiers (Section Diagram & Section Diagram 1). 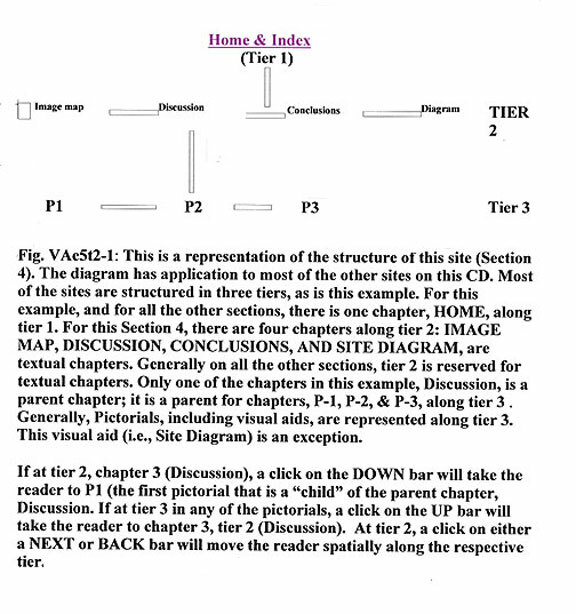 The first tier is always a single chapter (Home). The second tier generally will be devoted to textual material. The third tier usually will be devoted to pictorial components. Navigation bars in clusters allow the reader to migrate among the individual Sections, and to other web sites. The Directory is accessible in some of the clusters; it provides access to Sections on this site. Section Diagrams should be an aid in the use of the navigation bars (i.e., Up, Down, Next, and Back). The grey clusters to the left in most of the MasterBorders provide access to both the Directory, and a Section Diagram. There is also a second Section Diagram. The black bars are primary bars devoted to CHapters of the Section current in view. The Gray bars are secondary bars and provide access to other Sections. The Art of Histopathology is to be found in the imposition of Virtual Images. In this approach to histopathology, Patterns that are common and the correlations between those patterns and clinical behavior are emphasized. Names are assigned to those patterns. The more detailed the observations and the correlations, the greater the need for an expanded taxonomy. The concept of MDM addressed a borderland in pathology in which the simple assignment of the diagnosis of melanoma to a wide variety of patterns, regardless of the clinical import of such a diagnosis, has evoked controversy. The Section, Virtual Images, is part of an unpublished - and once rejected - manuscript. The original Introduction has been published (On the imposition of Virtual Images, and the Art of Pathology. Seminars in Diagnostic Pathology, 25: 136-139, 2009). This material is also in the nature of philosophy. The Whithers are a special contribution; they originally were available on the site of the late Bill Weems. I suppose they are more in the nature of philosophy than histopathology. The Section, Buster, is also special; Buster was a special young, adult, feral cat with special charm. He also was a feral cat that survived Katrina. Life obviously had meaning and purpose for him but was cut short. Maybe the Section, Buster, as a memorial, will give him a life of sorts.